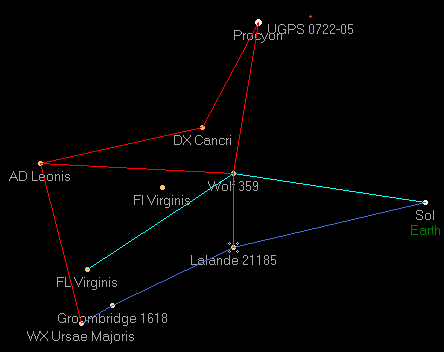 Lalande 21185 (Gliese 411) - Singular red dwarf (M2V) in the Ursa Major constellation located 8.3 light-years from Sol. The system is under U.S. authority, with free passage guaranteed for British and Australian ships. The system has five planets of note. A large military and civilian shipyard orbits Vindonnus with the wormhole back to Sol, and Andraste hosts major Helium-3 and deuterium mining operations.